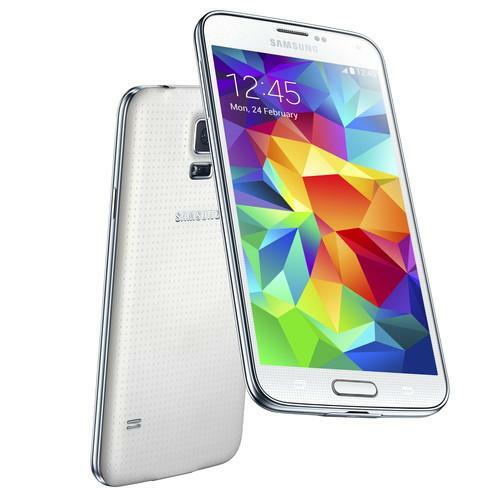 The Galaxy S5 from Samsung Electronics sports an improved camera and a fingerprint reader. Samsung used Mobile World Congress for the debut of the fifth version of its Galaxy S flagship family. The smartphone launch comes after Gartner released figures showing that Samsung's market share fell slightly in the fourth quarter of 2013. This was mainly due to a saturated high-end smartphone market in developed regions, so it is critical for Samsung to improve its high-end portfolio, the market research company said. But like many recent high-end smartphones, the Galaxy S5 is an evolutionary, not revolutionary, update for Samsung, Neil Mawston, executive director at Strategy Analytics, said via email. The dust-and-water-resistant Galaxy S5 runs Android 4.4, is powered by a quad-core processor running at 2.5GHz, and has a 5.1-inch screen with 1920 by 1080 pixel resolution. It has 16GB or 32GB of integrated storage, which can be expanded using a microSD card slot, and 2GB of RAM. The phone was expected to have 3GB like the Note 3, but Samsung apparently decided against that. Following in the footsteps of Apple, Samsung has added a fingerprint scanner. Samsung was also expected to follow in the footsteps of Apple and switch from plastic to aluminium. However, the company decided to stick with what it knows, but with a new textured back. The smartphone also has an integrated heart-rate monitor for use while exercising. Like many smartphone makers, Samsung is hoping that an improved camera can get consumers to open their wallets. The Galaxy S5 has a 16-megapixel camera with HDR and an enhanced menu and user interface, according to the company. The smartphone also has a fast autofocus and a feature called selective focus, which allows users to focus on a specific area of an object while simultaneously blurring out the background, it said. On the networking side, Samsung has implemented category 4 LTE and 802.11ac with MIMO. The Galaxy S5 features download booster, which improves data speeds by bonding Wi-Fi and LTE, according to Samsung. The company has improved battery life to let users surf with LTE for up to 10 hours. The Galaxy S5 will be available globally starting April 11, Samsung said, without revealing the price tag. "The S5 strengthens Samsung's position at the high end of the smartphone market, but the S5 is not an iPhone killer and Apple can breathe a little easier for now," Mawston said. In general, the smartphone innovation cycle is in pause mode, according to Mawston. "Smartphone makers, including Samsung, are currently in a holding pattern, waiting for the 'next big thing' to become commercially viable, such as rollable color touchscreens," he said.